Will interest rates go up or down? This is the $64 million dollar question. Supposedly, interest rates will remain in the low single digits because of central banks' quantitative easing (QE). The economy is expected to pick up as everybody will start to borrow to take advantage of the low rates. Is reality unfolding according to script, that is, the Investment Clock script (see left picture, one of many investment clock images widely available on the web)? Let's dissect recent events to uncover the truth behind the general trend. The investment clock provides us with a pattern that explains a complete boom-to-bust-to-boom economic cycle. However, as with most man-made patterns, we cannot take it at face value as the original author(s) might not have correctly observed the events over several economic boom-to-bust cycles. You not only need a very keen sense of observation but also a prolonged observation to ensure that your pattern can stand the test of time. As we now possess the hindsight benefit of recent developments in the global economy, we can test the investment clock pattern in this light. 6 o'clock - Falling real estate values? Check. Still going downhill. 7 o'clock - Falling interest rates? Check. Bernanke and co. have buried them for good. 8 o'clock - Rising share prices? Check. The Dow has recently touched 13,000. 9 o'clock - Rising commodity prices? Check. Oil is back to above $100 per barrel. 10 o'clock - Rising overseas reserves? Hmmm. The East Asians and the Germans have always been accumulating but have slowed down lately. As for the US, it cannot have forex reserves, otherwise the whole world will collapse. 11 o'clock - Easier money? Oops, we shouldn't be here. Quick, back up to 5 o'clock. Something has gone badly wrong. We've jumped the gun. Money is still tight. Even though it's cheap, the banks are not lending. They are worried not about the return on their money but the return of their money. They know that borrowers, be they businesses or households, are not going to earn enough income to pay back their loans. Simply put, Bernanke's cheap money is ineffective. What should be the next move? Should we hang on to the Fed's cheap interest rate while waiting for the depression to clear itself out? Actually, there's nothing that we can do. The Fed itself has fallen into the trap that it helped set up. It cannot move. Neither can everybody else. The debt deflation is not going out with a whimper. To appease the debt monster, the Fed continues to feed it, storing trouble for its future handler. Now, the investment clock's error is that it's meant for an inflation-induced recession whereas we're in a deflation-induced depression. The former is a short acute pain while the latter is a long-lasting chronic one. So to grasp the latter, you should view it as consisting of many repeating cycles of 2 o'clock to 6 o'clock, with short occasional breaks to the 7 o'clock and 9 o'clock range. Every time it breaks out, it comes back with a vengeance. The process iterates until the debt has been reduced to a level sustainable by the economy. Politicians and policymakers can only delay, not prevent, this natural sizing down of the debt monster. In an inflation-induced recession, demand or consumption is ever present. Only the supply or capacity is tight. This results in prices rising across the board. You need to bring demand down through high interest rates so that it is in balance with supply. Once demand has fallen, interest rates will follow suit. Prices of shares and commodities will then rise as everybody will get back to their old spending ways. The opposite is the case with a deflation-induced recession. Money is also tight at the deep end of the recession. In this case tight money is not characterised by highly priced money associated with high interest rates but by zero availability no matter how expensive you want to pay for it. In fact, a paradox happens: money is tantalisingly cheap but you can't even touch it. So near yet so far. Although money seems cheap, its real cost will be high. Recall that money is credit. The unsustainable level of credit is a major symptom of the depression, the root cause being the skewed wealth accumulation. But the first step in getting out of the depression is to wring out credit. In the process, prices of everything including gold, will collapse. This makes money expensive even at zero interest rate because money increases in value relative to other assets. Everybody wants to retain money rather than lend it out. And nobody wants to borrow unless he/she has no intention of repaying. Of course, technically, taking the debt to GDP ratio as the basis, we can also increase the denominator (GDP) instead of squeezing the numerator (debt) to bring back the ratio to a sustainable level. However, bear in mind that we're in the Fourth Kondratieff Wave. 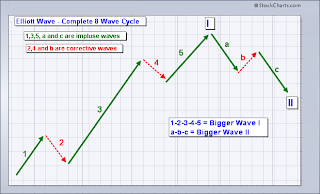 If you refer to the Elliott Wave chart (reproduced on the left) in the The Five Generations of Warfare, the fourth impulse wave (the green line denoted by the letter 'a') moves downwards, as does the fifth wave (green line 'c'). Henceforth, don't expect the GDP to grow significantly. Sure, we have unprecedented power to produce but we don't have the power to consume. Without consuming power, there's no necessity to produce. The other alternative is to tolerate high inflation. Inflation will enlarge the nominal GDP while the debt remains fixed. The debt to GDP ratio then will decrease to a more sustainable level. But this option is no longer available as the central bankers have trapped the whole world into decades of low interest regime with their QE bazooka. In the last 20 years, only the Bank of Japan (BOJ) had embarked on QE prior to Ben Bernanke's. Now other central banks, such as the Bank of England and the ECB, though in a roundabout manner with its LTRO, have started to follow suit. Bill Gross of PIMCO has warned us of the danger of extremely low interest rates. Japan is clear evidence why low rates can trap an economy in gridlock. The chart below (taken from The Wall Street Journal website in October 2010) shows that since April 1995, BOJ's overnight call rate has never risen above 1%. The Fed funds rate has similarly been stuck below 1% since December 2008. It's not that the Fed hasn't been through this before. In 2003 the Fed funds rate even dropped to 1% because of the need to reinvigorate the economy after the 2001 dotcom bust. The low rates drove real estate prices up. Bond prices on the other hand move inversely with movements in interest rates. So as the interest rates gradually increased from 2004 to 2006, the bond holders incurred losses but these were more than made up by profits on the surging real estate prices. Banks also reaped huge profits on the soaring demand for mortgage loans. A much longer precedent arose in the 1930s when rates remained in the doldrums for more than 10 years. As the Fed funds rates had not yet been introduced then, the annual average for the 3-month Treasuries rates, used as a proxy measure, fell below 1% from 1932 to 1947. That was a similar depressionary situation to that prevailing now. Hence we can expect our low rates to last till 2020. How did they get out of the low rates in the 1940s? They had the benefit of electricity, the main driver of the Third Kondratieff Wave. Because of WW2, economic growth from electricity, in the form of factory mechanisation and higher female labour participation, was delayed and even spilled over into the early part of the Fourth Kondratieff Wave. The 1950s and 1960s period was the American century, in which euphoric feeling, as currently experienced by China, prevailed. Also much reconstruction work had to carried out to rebuild Europe after the devastation of WW2. Demand was growing to meet the expanding production. So even though the bonds lost value, growth in other areas more than compensated for the bond losses. 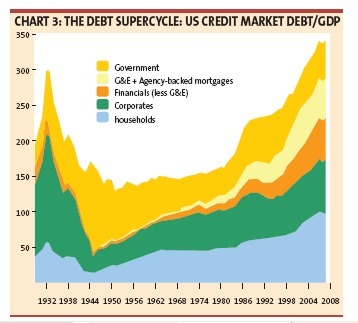 It should also be noted that the biggest chunk of the debt during the peak of the 1930s depression was non-financial corporate debt (see left chart from Forbes) which could be easily struck out with corporate bankruptcies. When WW2 came along, the depression was mitigated by the surge in government debt spending. But this debt surge was contained by the exceptional economic growth in the 1950s and 1960s, and inflation in the 1970s, putting a lid on the debt/GDP ratio. However the low inflation from the 1980s onwards has accentuated the rise of the debt/GDP ratio. Now with real estate prices going downhill since April 2006, and commodities vacillating in an unclear direction, Bernanke's suppressing of interest rates has pushed bond prices up. Their yields have fallen so low that any slight uptick in yields can result in substantial falls in prices. For example, take the 10-year T-bonds. Its current yield is around 2%. If its yield goes up by 1%, the bond price will fall by 8.5%. And if it rises to 6%, the fall in value would reach almost 30%. The Fed has become addicted to lowering the yield that Bernanke has hinted that he might buy the 30-year Treasuries, which currently has a yield of slightly over 3%. To fund the buying he'd be issuing short-term repos (repurchase contracts) to the banks. This has no impact at all on the money supply, only the long-term bond yield may go down. By doing this, he'd be tightening the grip that the bond market has on the economy. He can no longer countenance any rise in interest rates unless he wants to wreck the bond holders who are sitting on a large pile of bonds. The T-bonds alone now amount to $10.5 trillion, of which $5 trillion are held by foreigners and $1.65 trillion by US financial institutions. We can look at Japan's total credit market (left chart from The Economist) to see how its government bonds have transformed into a godzilla. The legend at the top is incorrect. The bottom band is financial, followed by government, non-financial businesses and finally, topmost is households. Seeing how big the government debt has grown, it's not surprising that Japan is suffering from revolving door leadership; the bond is the de facto leader, the shogun behind the premiership. Japan has no other option. Push up inflation and the bond holders will scream while the financial system will be crippled. Stay status quo and the godzilla keeps getting bigger as other asset prices continue deflating. Let's see how the US total debt market is stacking up. The left chart from The Economist also has the same erroneous legend as the Japanese chart. The chart which plots up to the first quarter 2011 still shows households (top band) as the biggest debtor. However the latest report from the Fed as of end 2011 indicates that the government debt has dethroned household debt from the top spot. And the government debt will be getting relatively much bigger as other debts will shrivel through debt write-offs. The trouble with government debt is that it can't be cancelled through bankruptcies or debt restructuring. As this debt progressively balloons, the effective future president of the US will be President Bond. Like Japan's, the nominal presidents will be lucky to last even one term. How do we get out of this quagmire? Only strong economic growth would do as the debt has grown too large to be rooted out by inflation alone. 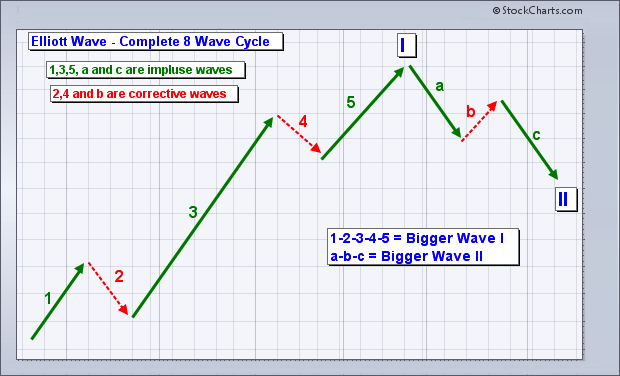 Probably equities may rise in the Fifith Kondratieff Wave. But we know the Fifth Kondratieff Wave will be weaker than the Fourth which in turn is weaker than the Third. If the US can't get out of this hellhole, then the whole world will face an utterly bleak future.